Brazil is well-known by its Samba, wonderful beaches and friendly relaxed people. It is often compared to more developed countries for its size, population and resources. 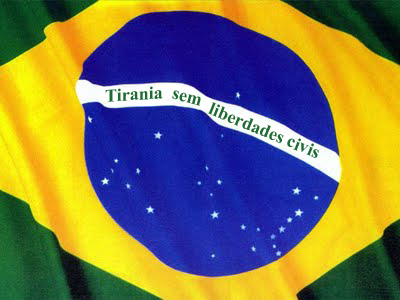 But there is one more way in which Brazil is similar to the so called developed world: It also violates civil liberties. Different from say, the United States or England, police here do not harass citizens that much. However, the violation of their liberties and rights is still done quietly. Brazil is a country with very limited access to information and people here know very little about their rights and duties. This panorama is fertile ground for government abuse and corruption. The giant of South America has been known to have some of the greatest impunity throughout the years. Corruption runs rampant from north to south and east to west. In a recent survey, it was determined that Brazil is among the first countries in corruption and impunity. Although much of this corruption amounts to politicians providing and receiving large sums of money for political favors, there is more beyond regular bureaucracy corruption. The former Portuguese colony is rapidly adopting globalist measures of population control, much like the United States, England, Australia and New Zealand. Throughout the last 12 months, a few newspapers have revealed in the back of their pages and in tiny one column articles, the almost compulsory nature of the vaccination campaign against the H1N1 flu, which although it has been proven to be a sham, continues to be implemented countrywide. Fortunately, some people have been made aware of the dangers of the vaccine, and the campaign has not had the results first expected by government health authorities. According to Zero Hora newspaper, only 670,000 elderly got vaccinated instead of the 1.4 million expected in the state of Rio Grande do Sul. Less than 50 percent have taken the regular flu vaccination. However, this does not mean Brazil can escape from the control of the World Health Organization. The vaccinations continue to be carried out for different population groups all over the country. Brazil also uses a form of fluoride in the water supply, a practice largely adopted for its supposed benefits on people’s teeth, but that has also been found to be pseudoscience. Recently this publication interviewed a head chemist at SEMAE, a government organization that cares for the quality of water in the town of Sao Leopoldo, Brazil. With a Master’s Degree in chemistry, she not only admitted she never saw a study that confirmed the claim fluoride, in any form, is beneficial to people, but also confessed that fluoride is put in the water based on the belief it helps to promote oral health. When asked about the dangers sodium fluoride and substances of the like pose to people, she said she never learned anything about that in college or training courses she attended. In fact, fluoride causes tooth decay, mouth cancer and several neurological disorders in addition to lowering intelligence. The country is in advanced stages of implementing National Identification Cards as well as using Airport Body Scanners. These last two technologies are already being used or will be in force in less than 10 years. In the case of the radiation emitting body scanners, there are several of them in national and international airports. According to the newspaper Zero Hora, from the state of Rio Grande do Sul, beginning in May 2010, travelers who board planes in the cities of Guarulhos, Rio de Janeiro, Recife and Manaus, may be selected as candidates for walk through one of the full body scanners. This measure is taken even though in more developed countries, the use of the scanners raised concern not only for the radiation they emit, but also due to the fact people’s bodies are seen completely naked in the images the machine generates. According to many civil rights and privacy groups the use of scanners is a gross violation of privacy laws. The images generated from the scanners are saved in hard drives and kept for further use in surveillance. Although authorities in Brazil deny the capacity of the scanners to provide such images, Angelo Gioia, from the Federal Police in Rio de Janeiro, admitted it is a more invasive method of surveillance. Currently, Brazilian laws allow for searches of people when there are founded suspicions of illegal activities, but do not regulate the use of this kind of scanners. Goia believes there should not be any limits when it comes to security. The cost of every body scanner is $170,000. Body scanning technology operates based on the use of millimeter waves over a body to measure the energy reflected back to render a 3D image.Millimeter wave scanners produce,30 to 300 gigahertz electromagnetic waves, something close to what a cellphone emits. The promoters of Airport Body Scanners always cite the huge benefits they provide in preventing safety hazards such as guns, explosives, etc. But the truth is that a pat down or bomb sniffing dogs are as useful or more accurate. Just as it has been done in other countries, in Brazil the use of this technology is presented as an added convenience, so more people receive it and adopt it willingly. Little is talked about the violation to the right to be private as persons and in our property. Added to the convenience, there is another factor injected in the adoption of the scanners: Fear. The threat of terrorism is the extra ace under the sleeve always ready to be pulled out in case people complain or find the scanners to be an inconvenience. How much terrorism is there in Brazil? Compared to other countries like Ireland, Israel, Palestine, Pakistan or Great Britain, the answer is: nothing. The country has never suffered a major terrorist attack in modern history. The closest to terrorism are the occasional shootings between drug lords and military police in small neighborhoods of Rio or Sao Paulo. So why does Brazil need the scanners? It does not. As in many other countries, the adoption of this technology is all about submission and loss of liberties. In fact, history shows that the most incredible terror attacks have been of the false-flag kind. Trend forecaster and founder of the Trends Research Institute, Gerald Celente, a notable guest in main stream media outlets such as CNN and NBC, believes 2010 will be the year of multiple government sponsored attacks. “It’s the crash of 2010 as we predicted it,” says Celente. “The global economy collapse in March of 2009 when they inflated the markets with fiat money.” Celente predicted the current crisis, falling stock market, civil unrest in Greece and the collapse of Iceland, Argentina, Portugal, Spain as well as the crisis in the United States and the United Kingdom. “Anyone who believes this kind of stuff is beneficial, deserves what they get.” Gerald Celente warns people on what will happen once this kind of policies are fully implemented. Watch this clip at 5 minutes and 30 seconds. When it comes to the National Identification Card in Brazil, information about it is very scarce. Most people here visit Federal Polic e offices all around the country to renew their driver licenses or identification and do not inquire or wonder about the new technology used in those documents. In other countries where it has been implemented, the National ID card is rejected by informed citizens as well as pro privacy groups because it contains all information related to the bearer of the card: Social Security number, physical address and a unique identification number that unlocks a wide variety private information such as bank accounts, savings, workplace, voting record, and so on. According to historian Daniel Estulin, the use of National ID cards along with other technologies is a push for creating a cashless society. “No more money will be needed, because you will have credit assigned to your identification number. The problem is you are not going to be the one deciding how many credit to put on the card. The government will.” Estulin as well as Albrecht recognize the existence of government databases for jobs, credit and crime, and warn the use of National ID Cards will allow for the creation of a worldwide complete database where everyone will be included. In Brazil, the issuance of the National ID Card will begin as a pilot project in every region. The card will be similar to a Credit Card, with a chip containing information such as the CPF or Cadastro de Pessoa Fisica, voter registration number, fingerprint, or an iris scanned image which will be accepted by the system known as AFIS or Automatic Fingerprint Identification System. This system is recognized worldwide, and is the one utilized by governments in all 5 continents. The resulting number will be a standardized RG or Registro Geral. With this local, regional and national database, Brazil will be one of the last giants in the planet to succumb to the plan to submit to a global registration program where corporations know each and every human being, no matter where they live.